Mandala Workshop | Arts and Crafts Workshop at Nungambakkam. 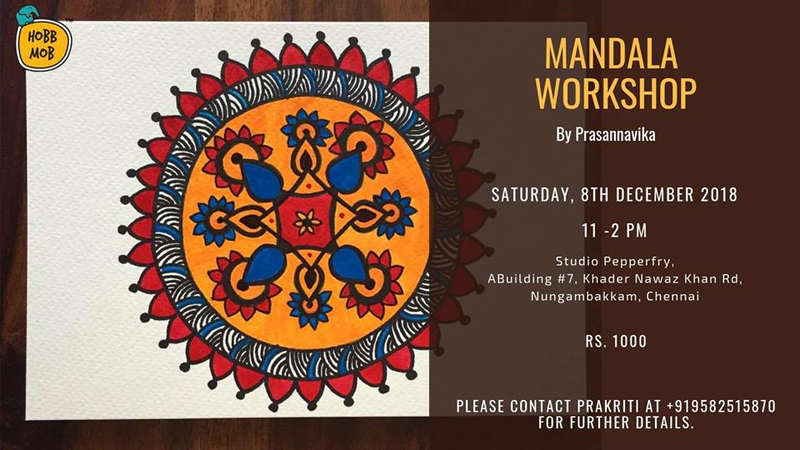 Presenting our first Mandala Workshop in Chennai! We are so excited to host this with our beautiful artist Prassanavika on the 8th December! Mandalas is a sanskrit word that mean 'circle' or a 'universe'. Mandalas are a beautiful expression of mindfulness and the universe. It starts with a small dot and with careful direction can turn into a beautiful array of colours and patterns. It is a meditative art form that helps one rejuvenate, release stress, develop focus, and find inner self. In this workshop, you will learn what a mandala is and a demonstration on how to construct the outline of a mandala with some fine markers and give it a beautiful design. By the end of the workshop you will have their very own mandala to decorate and meditate more often using this art form. All materials will be provided and no experience is required for this workshop. Come, Learn and Meditate with us Chennai Folks. Book your spot for this one of a kind workshop now!